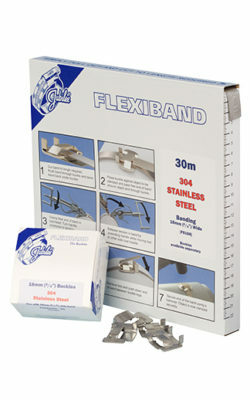 Jubilee Flexiband is a band and buckle system offering a high strength fastening solution in 304 Stainless Steel and provides 4 different band widths 9mm, 13mm, 16mm and 19mm. Flexiband is ideal for strapping items securely and can commonly be seen in applications such as sign fixing where the tamper proof nature of the product is of paramount importance. Please note: All technical data is for comparison purposes only. There are many variables in each application, such as hose, ferrule and medium, which make it impossible to provide data that is universally accurate. If you have a specific application please contact us directly for technical assistance.